9.7 Is due year a leap year? 9.8 If due day is February 29, is it a leap year? 9.12 How many invoices were settled within due date? 9.14.1 How many invoices were settled within due date? 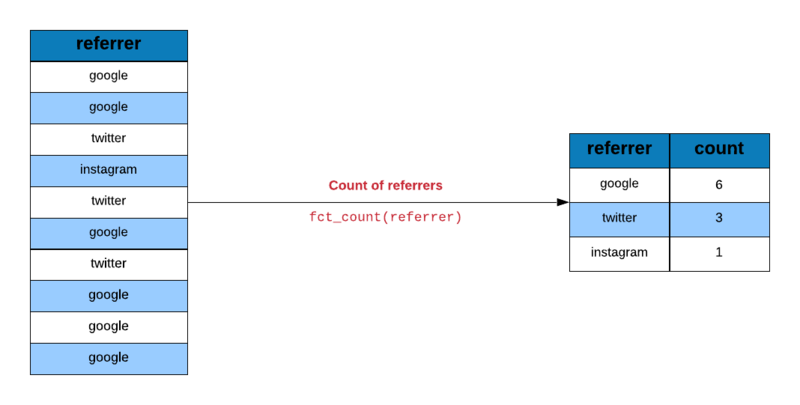 Let us extract the referrer column from the above data using use_series and save it in a new variable referrers. Instead of using ecom which is a tibble, we will use referrers which is a vector. We do this to avoid extracting the referrer column from the above data in later examples. Let us look at the traffic driven by different referrer types. If you want to sort the output in descending order, use sort and set it to TRUE. Use fct_unique to view the categories or levels of the referrer variable. 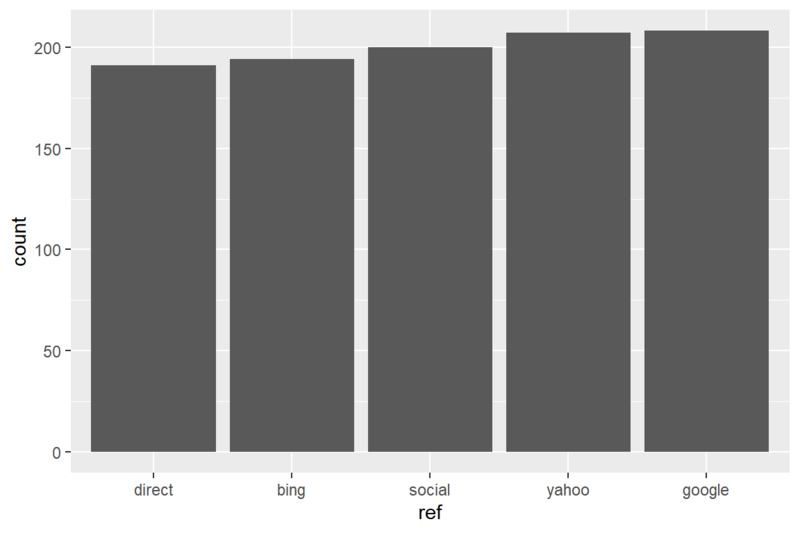 We want to examine the average number of pages visited by each referrer type. 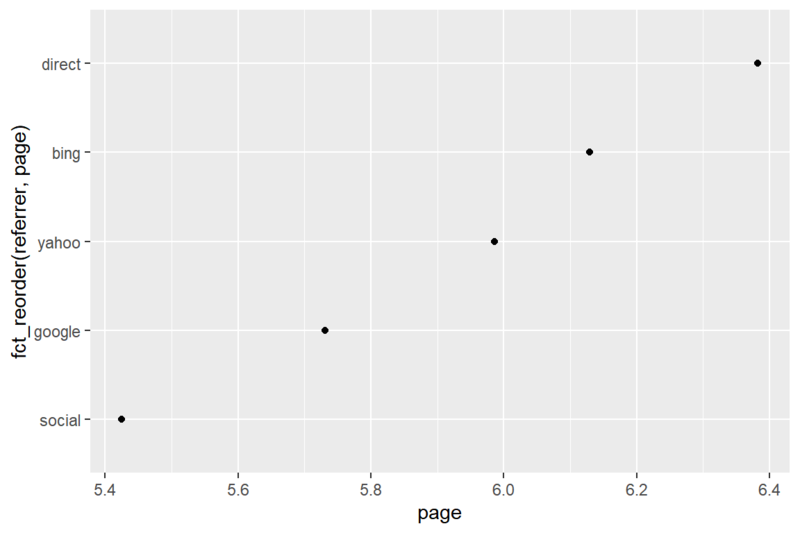 Let us plot the average number of pages visited by each referrer type. 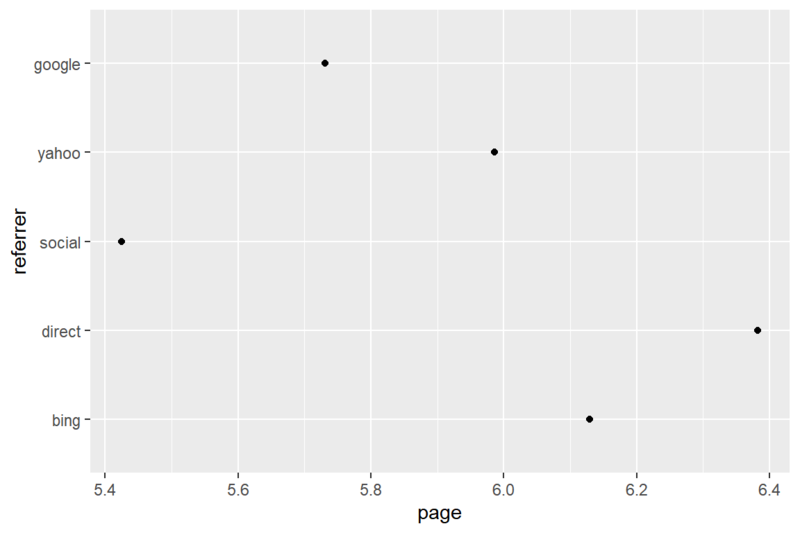 Use fct_reorder to reorder the referrer types by the average number of pages visited. Since we want to plot the referrers in descending order of frequency, we will use fct_infreq() to reorder by frequency. Now that we know how to reorder categories/levels by frequency, let us reorder the referrers by frequency and plot them. Let us look at the categories of the referrer variable. Since we want to plot the referrers in ascending order of frequency, we will use fct_rev() to reverse the order. Let us reorder the referrers by frequency first and then reverse the order before plotting their frequencies. The data set we will use has just one column traffics i.e. the source of traffic for a imaginary website. Let us extract the traffics column from the above data using use_series and save it in a new variable traffics. Instead of using traffic which is a tibble, we will use traffics which is a vector. We do this to avoid extracting the traffics column from the above data in all the examples shown below. Let us compute the traffic driven by different referrers using fct_count. To group categories/levels, we will use fct_collapse(). ##  "affiliates" "search"     "direct"     "social"     "unknown"
Let us group together referrer types that drive low traffic to the website. Use fct_lump() to lump together categories. 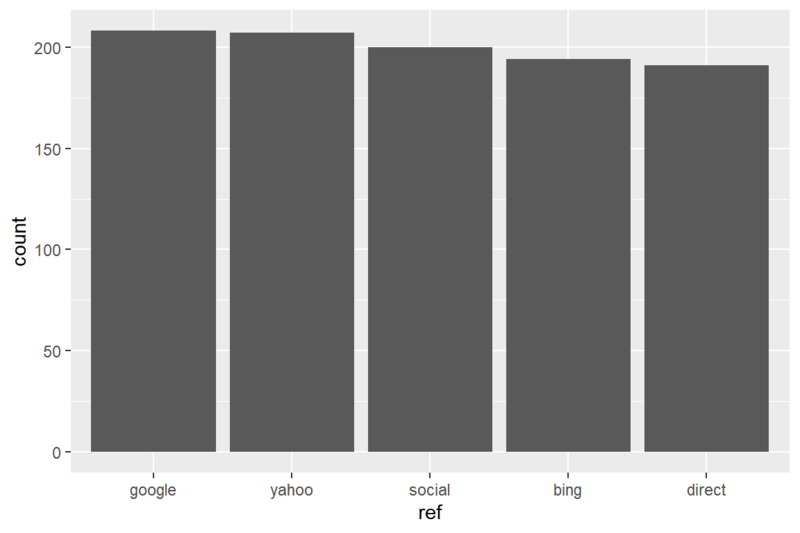 We want to retain the top 3 referrers and combine the rest of them into a single category. Use fct_lump() and set the argument n to 3 indicating we want to retain top 3 categories and combine the rest. Let us combine referrers that drive less than 10% traffic to the website. Since we are looking at proportion of traffic driven to the website and not the actual numbers, we use the prop argument and set it to 0.1, indicating that we want to retain only those categories which have a proportion of more than 10% and combine the rest. What if we want to retain 3 referrers which drive the lowest traffic to the website and combine the rest? We will still use the n argument but instead of specifying 3, we now specify -3. Let us see how to retain referrers that drive less than 10 % traffic to the website and combine the rest into a single group. Instead of setting prop to 0.1, we will set it to -0.1. Let us assume we want to retain a couple of important categories and group the rest into a single category. In the below example, we retain google and yahoo while grouping the rest as others using fct_other(). ##  "affiliates" "bing"       "direct"     "facebook"   "yahoo"
The categories can be reordered using fct_relevel(). In the above example, we reorder the categories to ensure google appears first. Similarly in the below example, we reorder the levels to ensure twitter appears first irrespective of its frequency or order of appearance in the data. ##  "twitter"    "affiliates" "bing"       "direct"     "facebook"
##  "yahoo"      "google"     "instagram"  "unknown"
If the category needs to appear at a particular position, use the after argument and specify the position after which it should appear. For example, if google should be the third category, we would specify after = 2 i.e. google should come after the 2nd position (i.e. third position). ##  "affiliates" "bing"       "google"     "direct"     "facebook"
##  "yahoo"      "instagram"  "twitter"    "unknown"
If the category should appear last, supply the value Inf (infinity) to the after argument as shown below. ##  "affiliates" "bing"       "direct"     "yahoo"      "google"
##  "instagram"  "twitter"    "unknown"    "facebook"
In this case study, we deal with categorical data which is ordered and cyclical. It contains response to an imaginary survey. Since we will be using only one column from the above data set, let us extract it using use_series() and save it as responses. ##  "like"             "like somewhat"    "neutral"
To shift the levels, we use fct_shift(). Use the n argument to indicate the direction of the shift. If n is positive, the levels are shifted to the left else to the right. In the below example, we shift the levels to the left by 2 positions. ##  "neutral"          "dislike somewhat" "dislike"
To shift the levels to the right, supply a negative value to the n argument in fct_shift(). In the below example, we shift the levels to the right by 2 positions. ##  "dislike somewhat" "dislike"          "like"